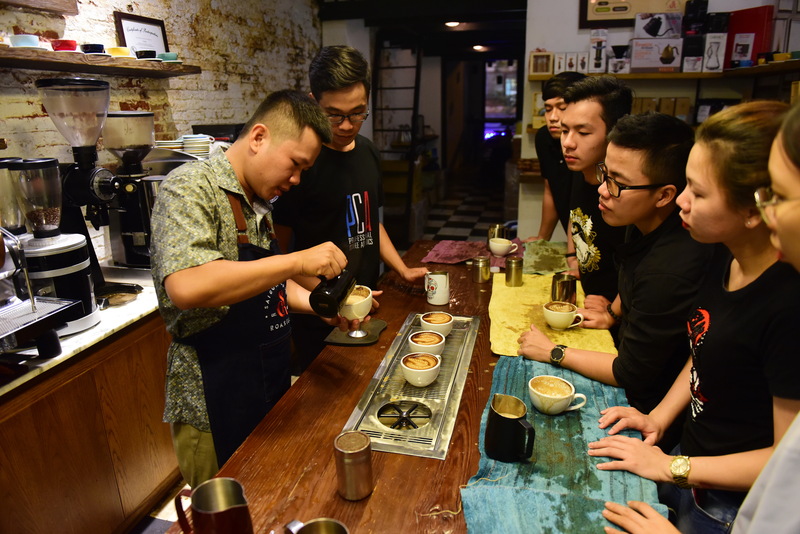 It was a normal evening at Saigon Coffee Roastery in downtown Saigon where owner Phap Vo devotedly instructed his students to pour milk into coffee to form their cups of latte art. 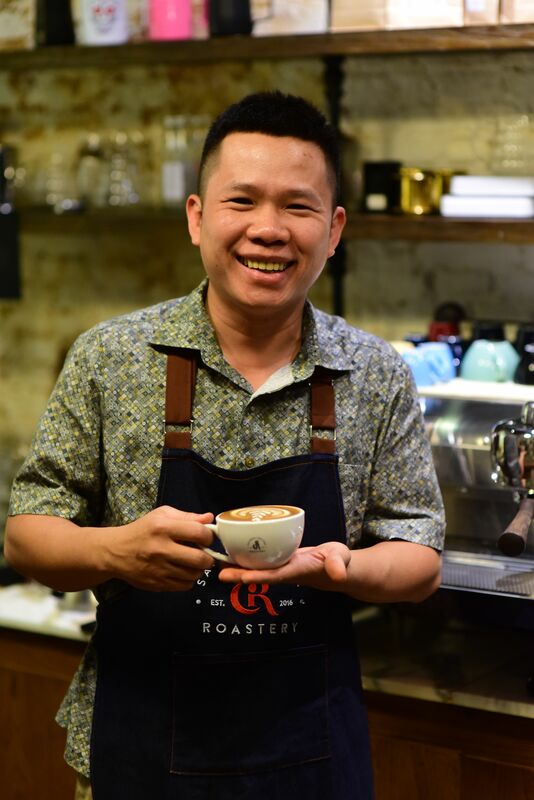 One of the city’s famous latte art masters, Vo Phap and his class has become a famous place for those who love coffee as well as those who want to become a barista. During the past three years, Saigon Coffee Roastery functions as a coffee shop in the daylight for those who come to enjoy a cup of specialty coffee, and is turned into a barista class when the sun goes down for those who want to make the drink on their own. Some of the learners just want to get more knowledge about coffee, while others consider barista their path of career in the booming days of brewing cafés. In a cozy room with coffee scent all over the air, students took turn to grind coffee, then put it in an espresso extractor before pouring milk over to create a cup of latte art. Some seemed to be familiar with the acts, some still struggled to control their cups. They came to the class with different purposes: those had experience working at coffee shops wanted to improve their skills, while others were just coffee lovers wanting to know how to make a DIY cup of latte. Nguyen Trang, 29, shared that she quit her day job and planned to study more about coffee before running her own specialty coffee shop. She also attended Vo’s classes on barista, latte art and coffee roasting a year ago. 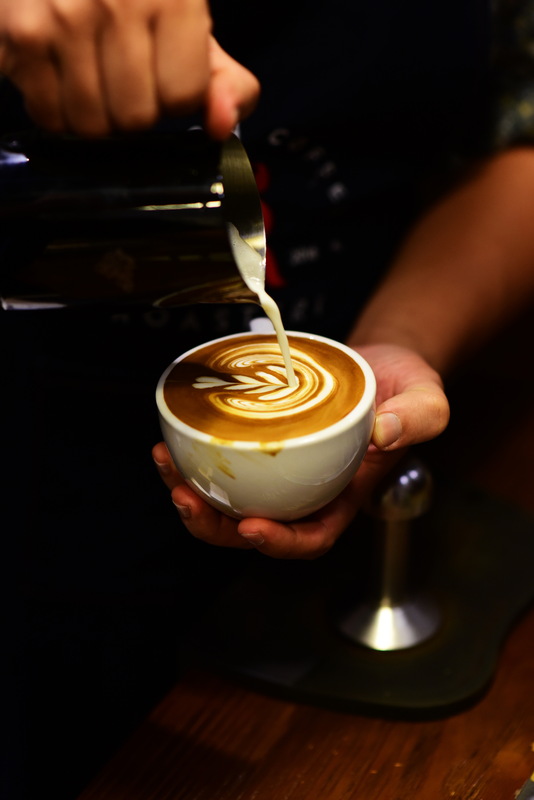 Meanwhile, 24-year-old Bui Minh Nhat, who makes drinks at a coffee shop in the neighboring city of Bien Hoa in Dong Nai Province, travels every day to Ho Chi Minh City to participate in Vo’s barista and latte art classes to get more knowledge about coffee. Ngan Ha, 32, also moved from Dong Nai to Ho Chi Minh City for two months only to join Vo’s classes because of her love to coffee. “I’ve known about barista but never had a chance to approach this career,” she expressed. “I’m addicted to coffee and tried to learn from videos on the Internet but did not success, so I decided to sign up for this course. “I have not planned big yet, just want to make coffee for myself and family, but if opportunity comes, I think I would follow this path," she said. According to professional barista Phap Vo, most of his learners are in the age of around 25. In recent years, his classes have started to receive learners who already worked at coffee shops coming to get their skills improved. Besides, Vo’s classes are also the place where students come to learn with the hope that they could get a part-time job when going to study abroad. The professional barista said that his biggest happiness while teaching is meeting learners who have a real passion for the job. According to him, young people who want to become baristas need to have a goal in their mind, as this job requires those who have the passion to pursue it till the end. Baristas also need to continuously update their knowledge about coffee, Vo added. “The inspirer” is how many learners love to call their master Phap Vo. 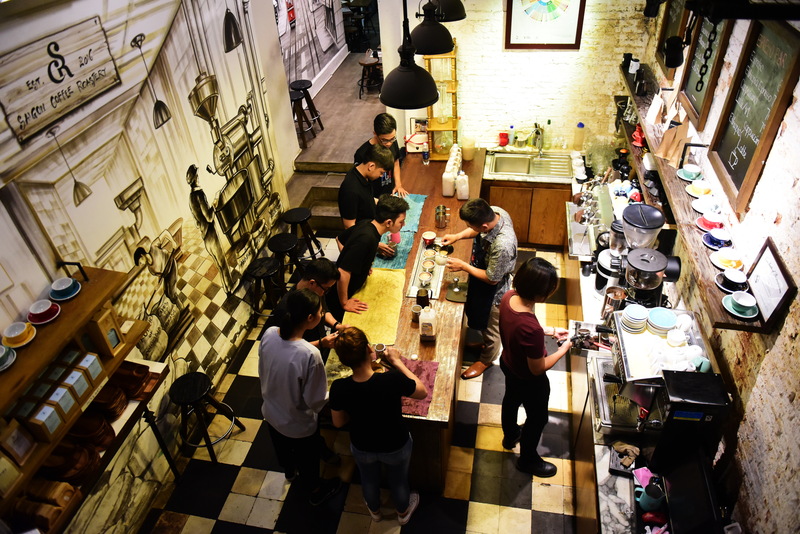 With nearly ten years working in the industry, the 35-year-old man is one of the biggest names in the barista world in Saigon, especially in making latte art. The Saigon Coffee Roastery coffee shop which he founded only three years ago has also been ranked #11 of 512 coffee and tea places in Ho Chi Minh City by TripAdvisor. The American travel and restaurant website also awarded the place with a certificate of excellence in 2018. Coffee served at the shop is roasted by Vo and only used in a certain amount of time. In 2011, Vo founded Barista Saigon, which operates as a playground for people who love the job. The group’s Facebook page, which provides announcements of new barista courses and recruitment information from coffee shops around the city, has so far reached more than 13,000 followers. Every year, the group collaborates with enterprises to organize the Latte Art Championship, a competition where young people come and show their talent. Vo used to be a bartender; however, he did not stay long with the job because he did not drink alcohol. He then started to turn his career into coffee in 2009, the time when barista was still not a popular job in Vietnam. Vo recalled his turning point in 2010 when he won the highest prize at a competition for baristas held by Italian renowned coffee brand Lavazza. After the victory, Vo got encouraged to quit his job at a five-star hotel in Saigon and moved to working as a trainer for ily, another Italian famous coffee company. The job of barista in Vietnam is in its golden days, commented Phap Vo who has had more than eight years of experience doing barista job. “Barista is a stepping stone for young people to get deeper into the coffee business,” Vo said. “Once one walked through the barista position, the experience would be very useful when he or she gets to a higher position in their career. “Then they will be able to observe a staff and know if he is doing correctly. “Being a barista is an indispensable foundation for those who want to pursue the coffee career,” he explained. Nguyen Hoang Vu, now 28, was a student of Phap Vo six years ago. He now assists Vo in his classes. Vu shared he was fascinated to the job after watching a video featuring Vo Phap and his latte art skill. After that, the young man decided to study with Vo. In 2017, Nguyen won the Latte Artist Champion competition, before scoring the third prize at the 2018 Latte Art Competition held by non-profit coffee event organizing association Professional Coffee Athletics. “I love to teach, as I can inspire people who share my passion, just like the way Mr. Phap Vo has done to me,” Nguyen expressed. According to him, the recent years has seen an increase of not only young learners but also those who have real passion, even though the job’s income is not very high at the time.